Despite being one busy girl, that Mrs. Claus always seems to be in such a cheery mood. She has to bake cookies for all the elves, help Santa take care of the reindeer and she even has to pitch in with toy-making. That would be enough to make anyone feel a little bit “humbug” about Christmas, but not her! We were sure how she was keeping so chipper, so we did a little investigating and we think it has something to do with the bright red colors she wears. If you want to feel the holiday cheer, just like her, then all you need is this Santa Claus Sweetie costume! 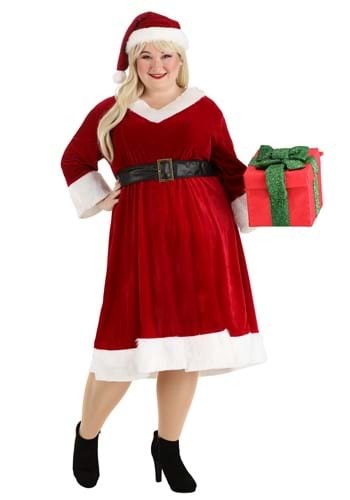 Our Santa Claus Sweetie costume is a plus size outfit that recreates Mrs. Claus's look in impeccable style. The red velour dress has white faux fur trim and a modest v-neck bustline, providing a look that's both comfortable and flattering. The black belt around the waist has a gold buckle. The matching red Santa hat finishes the costume with perfect yuletide spirit. Once you have the entire ensemble on, you may feel like baking some cookies, or throwing the best Christmas party on this side of the North Pole!